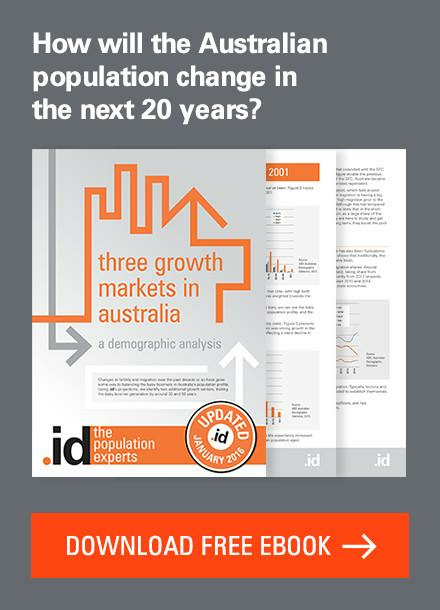 .id was recently asked to present at the Western Sydney University Senior Management Team Conference. The objective was to set the University’s strategic trajectory based on relevant evidence and projections (we were presenting the ‘relevant evidence’ and ‘projections’ part). 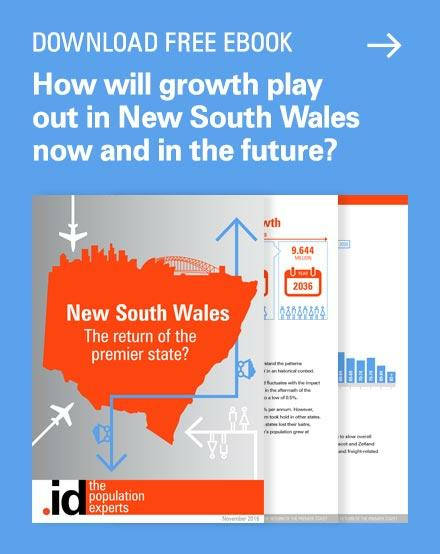 Greater Western Sydney’s (GWS) population growth is expected to grow from 2.2m to 2.9m, to house more than 50% of the Greater Sydney Region’s population by 2036. This is based on forecast household growth from 730,000 to over 1.1 million over that period. Who said demography is destiny? Oscar Wilde? Mark Twain? Winston Churchill? Whoever, it is one of those ‘circular’ statements that are hard to argue against, is probably not that useful and personally, I’m not sure what it means. Nevertheless, it suits me as the founder of a demographics enterprise; and perhaps it suits our efforts today as a theme to explore with you. I’m here today with my old friend and colleague Johnny Barnard. Johnny is a brilliant guy and we’ve worked together for almost 30 years. I mention this because it is relevant to today’s presentation because Johnny and I have been observing and analyzing the growth and change to Australian cities like biologists looking at fungal growth in a Petrie dish. 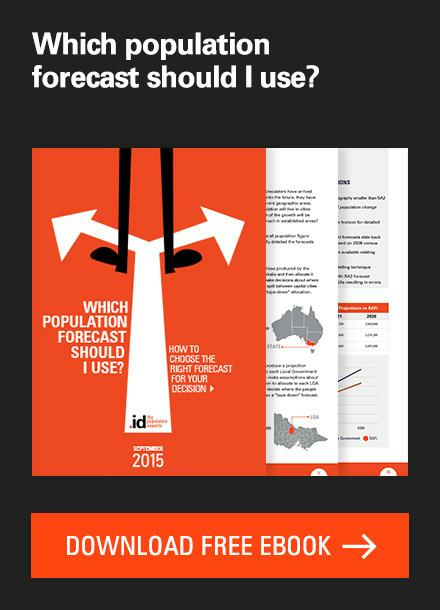 Our business, .id, has created the industry standard for the delivery of demographic and economic profiling and forecasting resources to local government across Australia and New Zealand. It is the global availability of our online resources that brought us to the attention of geographers at Western Sydney University (WSU). In particular, the fact that we provide demographic profiling to all local governments across the western Sydney region made .id visible and relevant to your business. As you are strategists, it is important for you to understand you can access these resources to inform your decision making. I think it is also important for you to understand the context of the work we do at .id because not only are we service providers to WSU, but our story and learning history is an interesting and relevant one for the work you are doing at this conference and beyond. 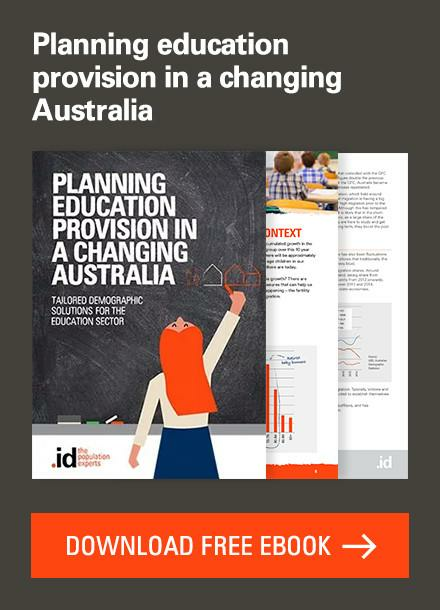 .id started 20 years ago on the presumption that making informed evidence-based decisions was not a strength of local government. We recognized that Census data, was a completely underutilized resource. It is a rich source for understanding places; for insights into the role and function of places and how they are likely to change in future, based of course on the social-economic and demographic characteristics of people. 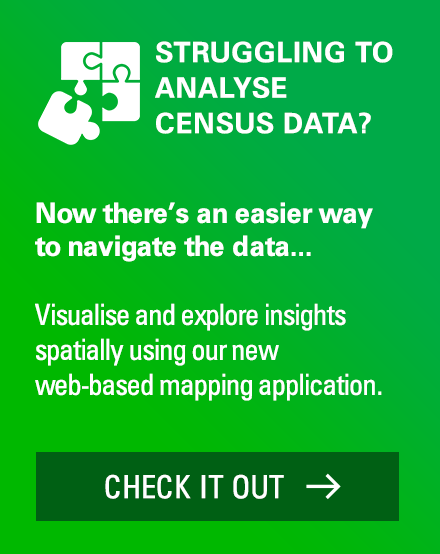 We have been delivering intuitive web apps full of census data structured around answering questions about place – their role and function, providing profound insights for planners and service providers, giving them a powerful basis for decision making. These apps incorporate mapping, we expanded them into the economic and forecasting realms. As planners ourselves, we designed these as the ultimate tools for local government decision making. Our forecasting work requires us to develop a deep understanding of the demand and supply of land for housing – a field where, we as experts, have seen profound changes. 80% of new dwellings 25 years ago were built on the fringes of our cities. Now a much larger share of total dwellings is built throughout the established parts of our cities, rather than on the fringes. Factors driving people’s housing choices have profoundly changed, accompanied by massive shifts in migration patterns. Understanding the nexus between how we plan for housing and economic development has become necessarily central to our work. Housing was once almost entirely in the social policy realm, now any strategic planning for housing worth its salt sits firmly in the economic development realm. Why is it that there is such high demand for housing in parts of our cities where there is the some of the most expensive housing in the world? 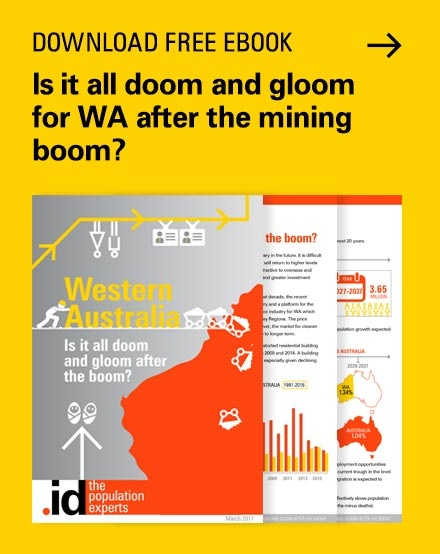 The post-mining construction boom period in Australia has seen, by almost any standard, a surprisingly successful transition from a 20th-century economy to the new economy. 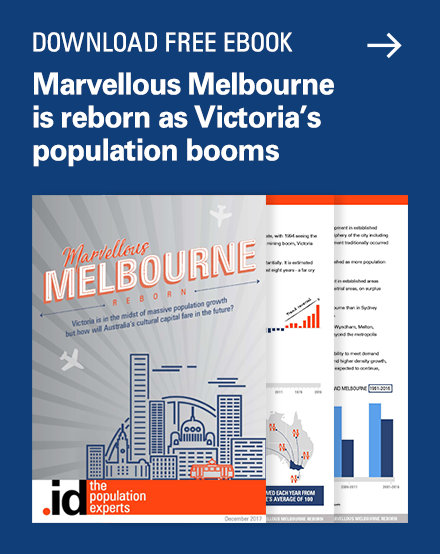 Granted, there are issues with poor wages growth and inequality, but there has been a huge readjustment mirrored by migration both intra-national and international of people moving to our cities for economic opportunity. Record levels of overseas migration driven by the new economy’s insatiable appetite for highly skilled workers, for who we in Australia are competing with other successful economies around the globe. Western Sydney sits at the Centre of this. Just in Blacktown alone, the above migration map shows a net gain of overseas migrants approaching 20,000 people between 2011 and 2016 (or nearly 4,000 per annum). Overseas migration feeds thousands of people into western Sydney each year. These people are young, skilled and fertile! Yes, they not only bolster the population by contributing to migrating there, but they have babies too. Among numerous other nationalities, there are a large number of Indian and Chinese, all bringing with them cultural uniqueness. India and China are incredibly diverse places in themselves, representing multiple religions, languages and ethnicities. Apologies for stating the obvious, but it must be said and repeated. Western Sydney is not a monolith! It is an incredibly diverse place. Western Sydney as a region has the youngest age structure in Australia. It is one of the most diverse places. It has pockets of grinding poverty, youth unemployment, and underemployment; pockets of low levels of education and disaffected youth. It has the attention of our political leaders, with associated plans and proposed investment. It is finally getting Sydney’s second airport, albeit 20 years too late. Transport infrastructure that is not Sydney CBD-centric is finally being planned. And the need for ‘20-minute cities’ is not about getting to work within 20 minutes, but about the need for agglomeration. What we are learning about cities of the 21st century is that ideas rule. The more ideas per square metre you can achieve, accompanied with world-class ‘enabling’ infrastructure and environment and amenity, then the more successful your place will be in the new economy. If you look at western Sydney in its current structure, it is a museum example of a 20th-century city. Big swathes of land use separated for manufacturing, commercial, residential. Almost entirely car-dependent. While jobs have been growing largely because of population growth, job densities haven’t kept up. Over 150,000 people leave western Sydney each day to go to work elsewhere. The 20-minute city is a huge challenge. The new economy jobs growth in concentrated in the large agglomeration of Sydney’s CBD. This is where jobs growth has resulted in more jobs there than there are employed residents. 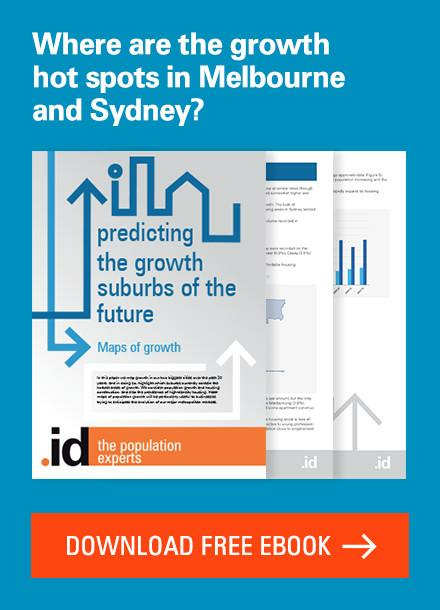 The success of the CBDs of Australian cities is proof of the importance that agglomeration and long-term infrastructure investments play in the transition to the new economy. I’m talking about investments in cultural, health and education institutions; major transport nodes and world-class amenity. Herein lies the challenge for western Sydney. We know that it’s not just about urban form and the availability of housing and transport. New economy businesses need to access people with high levels of knowledge and skill. The primary resource of the new economy is skilled people. Higher education takes the raw material and converts it into highly skilled, flexible, agile, emotionally and socially mature, skilled people. Now more than ever, education plays a central role in the development of our economies and societies. In 2015, for those with higher education levels, they achieved 86% participation rate, 4.5% unemployment rate, 74% were employed full-time, with a $1,151 median weekly income. In contrast, people with no qualifications had a 66% participation rate, 8.1% unemployment rate, 61% were employed full-time, with a median weekly income of $784. Western Sydney has the raw material – a huge and growing pool of young people. Western Sydney is structured as a 20th century city but is slowly transforming, evolving into a 21-century city with infrastructure investment and planning (but it needs much, much more). Western Sydney has inequality (the scourge of economic and social development) and education is the most surefire ticket out of poverty. Western Sydney University is central to the transition of western Sydney into a 21st-century city. There are strong spatial elements to each of these. Demography is destiny in that we age one year for every year we live; we will all die; some of us have children; we migrate to where we perceive opportunity presents itself; we form households of various types that are influenced by our social and economic circumstances. But our destiny really lies in how we anticipate the future and plan for it. How we choose to intervene to adapt the future to a favourable outcome. It is about making informed decisions about how we want to impact the future. This is what makes our destiny. There are two aspects to the challenges that the strategists at western Sydney University face; one is to sustain your business and thrive; two is to ensure your destiny as a major influencer in the future of the city because if you do that well, your business will also thrive. We closed this presentation with the following questions that we asked the management team at Western Sydney University to ponder. If you’d like to add a thought or comment, please do so in the comment section below! Which model would be most effective for WSU to access its market effectively and address the threat of inequality to Western Sydney’s future? With thanks to the staff at Western Sydney University for hosting us and allowing us to share this presentation to a wider public audience. Hi Ivan. Great read. I’m ex Western Sydney ‘born and bred’ myself and have also taught at UWS. I would be interested to hear more of your thoughts on the New Economy and the skills required for it. I currently live on the Gold Coast which is a radically different region to Western Sydney. But the challenges of developing the skills required for the New Economy are much the same… or are they?